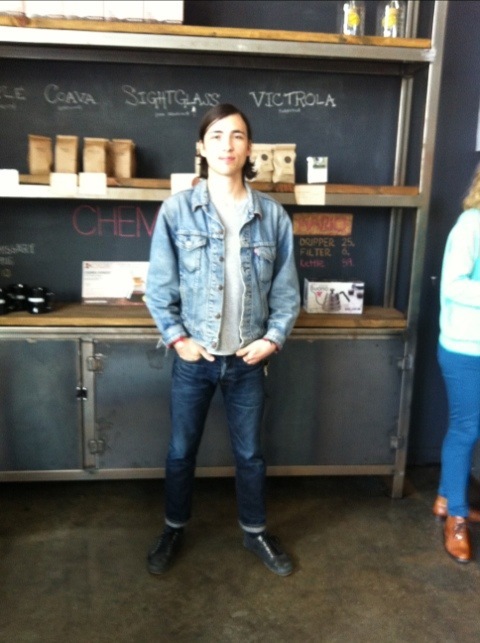 Another hour, another Canadian Tux at Coffee Commissary – a.k.a. Land of Denim. If you think I’m joking, I saw SIX Canadian Tuxedos in less than 2 hours there yesterday. Today, I had the pleasure of meeting Rheese Detrow, drummer in the band Dendelo, which just completed a new, yet-to-be-named album of raw/aggressive rock. Rheese is such a sweetheart; trying to imagine aggressive coming from him … I digress. Anyway, Rheese is seen here in a vintage flannel-lined Levi’s jacket and LA-based Schaeffer’s Garment Hotel 15 oz. Japanese Denim jeans. This entry was posted on Wednesday, February 29th, 2012 at 7:42 pm	and tagged with Canadian Tuxedo, Coffee Commissary, Dendelo, Denim, Denim on Denim, double denim, Fashion, Levi's, Los Angeles, Music, Rheese Detrow, Schaeffer's Garment Hotel, Vintage, West Hollywood and posted in In The Wild, Music. You can follow any responses to this entry through the RSS 2.0 feed.